Wow… this is incredible news! There have been several ‘turn arounds’ concerning possible methane detection on Mars with a lot of uncertainty surrounding each claim – ambiguous at best. Now this! Way cool! It has been known since 2003 that at least part of Mars’ interior is molten, based on how easily the Sun’s gravity distorts the planet’s shape. A possible energy source for methane production? If there were a heat source near the surface somewhere it might keep an aquifer(s) liquid? Life there? Lets say that crustal fracturing due to asteroid or cometary impact provides a conduit for magma to rise near the surface. Would there be a stable environment for liquid water there? Could that thermal source could be tapped for power? Regardless, these are very interesting findings! NASA Scientists are not at liberating to assume the existence of aquifers (liquid water) and conduct science. For the rest of us, we can consider the physics of the matter. If I recall correctly, liquid water will exist at 20 meter depth on mars due to the pressure/weight of the rock above. Life on earth exists at depths of miles under ground. Yes just as the Sun imparts tidal forces on earth, mars experiences the same. The eccentricity of mars orbit causes a greater variation in those tidal forces. Also the tilt of mars varies so greatly over eons, tidal forces would vary even more on any interior formations. The release of methane adds to our understanding that Mars is active and not a dead planet. For those excited about a journey to Mars, they must be dreaming of jumping oh the next barge to Mars. Thanks for sharing your comments and ideas! I just read over at ‘Brand X’ aka SPACEFLIGHT 101, a story about the new Raptor engine SpaceX is building. They are going from a LOX/RP fuel to a LOX/CH4 (Methane) fuel. With Mars in mind, they intend to use a Sabatier reactor to produce methane on the surface of Mars? I think they should build a prototype and put it on the next/2020 Mars lander! Just for grins they might be able to make enough fuel to power a sample return rocket? Curiosity Rover detects Methane – ‘Tis a Martian fart. So this is not really a “new discovery” or development; it is simply a CONFIRMATION of what other instruments from other researchers have been claiming all along. The only thing really note worthy is that Curiosity has provided the “extraordinary evidence” appropriate for this type of claim. It will be very interesting when this level of investigation and proof is brought to bear in areas which have indicated as much as 30 parts per billion according to other research methods. I would think that THOSE areas would be the places to do further research on the causes of these organics on Mars. So few rovers … so many places to investigate … What a great time to live in! 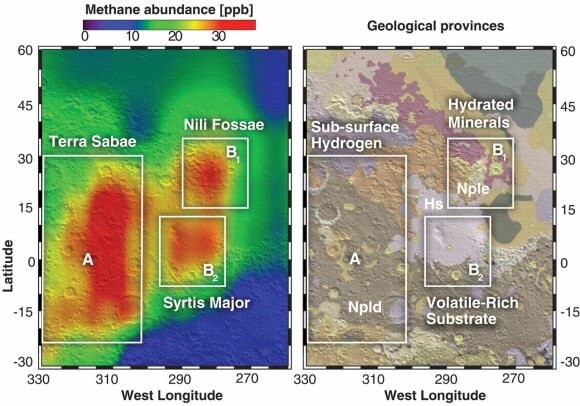 Looking back to the original methane detection, although the highest concentrations were further west in 2009, there was some emission in the band crossing Gale crater at the summer solstice, less at the autumn equinox. Relating that to the Curiosity detection dates, the smaller outburst around Sol 300 was before the spring equinox, but the bigger one bracketing Sol 500 runs up to the summer solstice. This looks real! Duncan. Excellent. Thanks for adding this additional detail. Thanks Tim. I didn’t notice the possible significance of the dates until after I’d been interviewed about the story on BBC Scotland, and It broke just after I’d reviewed Rod Pyle’s “Curiosity” for Concatenation. I’m about to send them a revised version! What I’ve been looking for and can’t find so far, is Mars methane observations for the summer solstice of March 2012 – just articles saying ‘Curiosity will settle the question’. Right now we have peaks in 2009 and 2014 – could be volcanic, but why should volcanic activity be tied in with the solstices? To paraphrase “Live and Let Die”, once could be happenstance, twice could be coincidence, but three times looks like biological action!